The automotive industry’s first pre-screen solution! What if there was a way to know a prospect’s exact credit score and trade information BEFORE you started every deal? And what if this ‘soft pull’ didn’t require a Social Security Number or affect your prospect’s credit, and all it took was a name and address? And what if it only cost you 99 cents? Would you sign up for it in an instant? Instant Screen is the automotive industry’s first pre-screen solution. Start every deal right, every time! When you begin your sales process with Instant Screen, saving time and maximizing profit is guaranteed! Instantly know the prospect’s credit score. Are they a prime, near-prime, or sub-prime buyer? Do they qualify for your best lease programs? Instant Screen takes the guesswork out of quoting payments. It also tells you if they have been shopping for a vehicle in the last 30 days. Instantly know the details of their current auto loan and potential trade with a free Auto Summary included with every Instant Screen. What is the Term, Remaining Term, Payment, Amount, % of Loan Paid, Late Payment History? All this information and more is available instantly with Auto Summary. 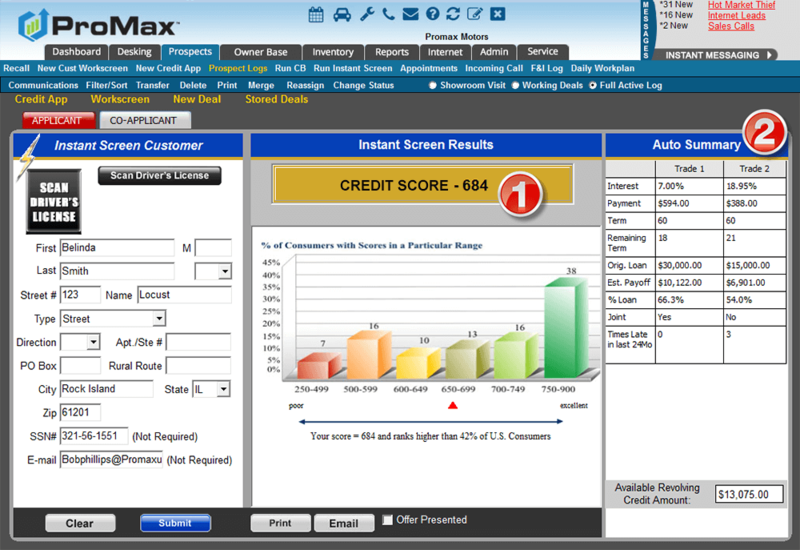 Instant Screen is the automotive industry’s first and best credit pre-screen product. Developed jointly by TransUnion and Dealer Marketing Services, the makers of ProMax Unlimited, Instant Screen is a powerful tool that enables you to put your customer on the right vehicle and the right payment right away.